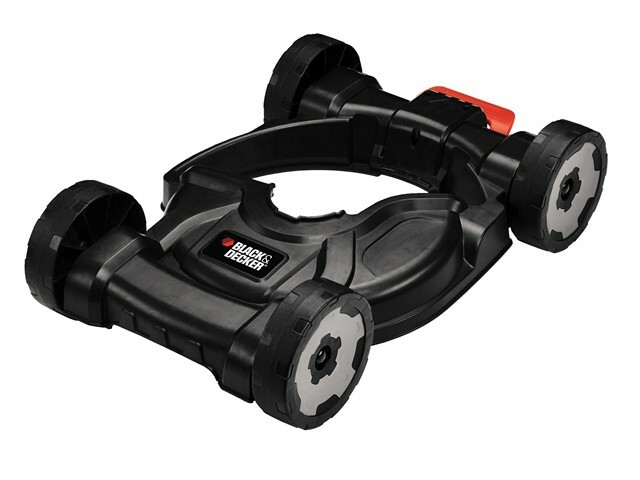 Black and Decker CM100 3 in 1 Strimmer® Deck that has a lightweight wheeled base which allows you to use your Strimmer® like a mower, for easier and more consistent cutting over small turfed areas. Adjustable wheels allow you to easily change the height of cut (either 40-60mm). It is lightweight and portable, so it is easy to carry and use on uneven ground and steep inclines. Features a unique click and go system so that the string trimmer simply clicks into the base, enabling easy change from trimming to mowing. Compatible with the following Black and Decker® Strimmer® products: STC1820, STC1815, ST5530, ST4525, GL5028, STC1820D, ST5528, and GL5530.